I don't often follow news from furry conventions I've never attended and/or aren't on my radar to attend in the future. There's only so much fandom news I can absorb, and keeping up with every con's announcements is not a priority for me. So, when a close friend came to me and said that Furpocalypse (a traditionally Halloween-themed convention in Connecticut that rose from the ashes of FurFright) had announced a highly controversial theme for their convention, it was the first I heard about it. This friend asked my opinion, as a trusted friend with relevant life experience who tends to take a fair and reasonable view of controversial issues, so I dug into the convention's website and Twitter feed to see what people were upset about and try to determine what I felt about it. I didn't have to dig very far. 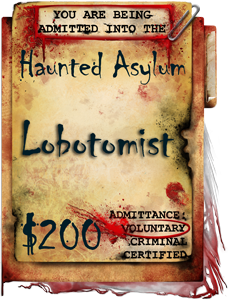 The theme announced for Furpocalypse 2017 is "The Haunted Asylum". Given that the convention occurs on or near Halloween weekend, and typically draws its themes from horror movies, games, and stories, it's easy to see why this was on the list; similar settings are often used for plots based on urban exploration, invoking the specter of the atrocities committed in the early history of the mental health system as well as the suspense and fear of haunted hospitals/prisons. However, it's also easy to see why this would be a controversial choice; while the US mental health system is less horrible than it used to be, it still does plenty of harm in a wide variety of ways, and anyone who has dealt with it first-hand or second-hand has seen this in vivid detail. For anyone who has been in a present-day US mental hospital, the experience is almost universally traumatic. It sometimes results in an overall improvement to quality of life, but that almost feels like an afterthought in such facilities. I still have nightmares from the time I took a friend to a local hospital for voluntary admission, and I wasn't even the one being admitted. Such facilities in the US, even the best ones, are basically prisons with nicer-looking walls, where patients have little to no voice in their own care, and are frequently subjected to medication and treatment that they did not consent to (one particularly well-known example is the overuse of sedatives and restraints). And patients in such facilities usually have very little contact with the outside world; they're usually stripped of their personal electronic devices, and while they can usually make phone calls, they rarely have internet access. Visiting hours are heavily restricted, compared to normal hospital policies, and non-family visitors sometimes aren't allowed at all. Subjecting people with physical health problems to these conditions is considered impossibly cruel, but for some reason, it's completely fine for people with mental illnesses. So, this choice of theme is questionable from the start, and somewhat insensitive, but it could've worked without being significantly more offensive than what other conventions have done, by presenting it as a relic of mental health history that attendees are exploring, encountering the ghosts of past patients or employees. 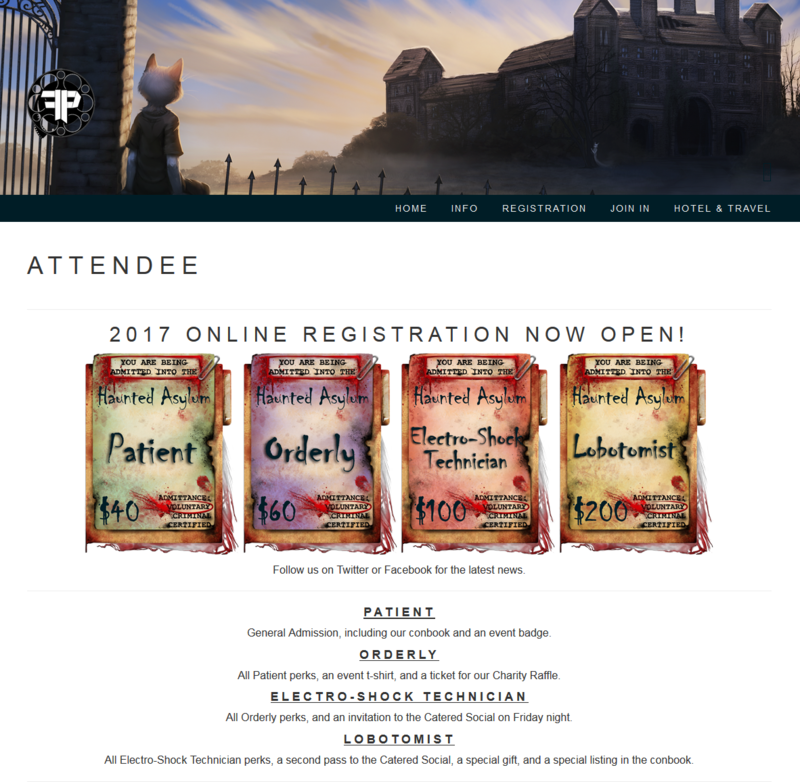 Unfortunately, the convention seems to have gone in the opposite direction, implementing this theme in the most tone-deaf, offensive, and potentially-traumatic way possible; instead of being spectators to the past, Furpocalypse presents their theme in a way that seems to glorify the atrocities of the past, casting attendees as actual patients and employees. For example, the names of the attendance levels are associated with very serious power imbalances; regular attendees are "patients", but the rest are varying levels of what would usually be employees. And the upper two ("Electro-Shock Technician" and "Lobotomist") invoke pretty horrific procedures; electro-shock therapy is controversial at best, with little evidence that it causes more good than harm, and lobotomies are no longer performed at all because, well, removing chunks of brain as a cure for mental illness is like curing a heart attack by removing chunks of heart. 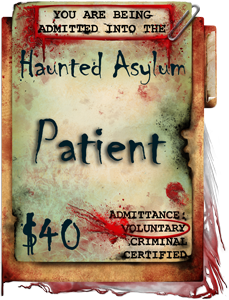 And even the extra flavor text in their graphics, like "You are being admitted" or "Admittance: Voluntary, Criminal, Certified" (with "Voluntary" circled), are pulled straight from the worst parts of the actual history of mental hospitals. "Certified" used to mean "Permanent", and it was a life sentence in what was effectively a prison, but determined by a single doctor's arbitrary opinion instead of the criminal justice system, with no opportunity for appeal. The convention's Twitter feed continues the trend of awful word choice, invoking actual atrocities of the mental health system ("strapped in and ready for treatment", "accepting new residents", "even our most deranged mad doctors couldn't sedate our excitement"). It then goes a step further by directly conflating mental hospitals with prisons, using phrases like "We've got exciting news since our release from solitary! "; solitary confinement is certainly a feature of mental hospitals (albeit less common than it used to be), but it's more strongly associated with prisons, and the concept is the same: An inhumane form of punishment where a person is locked in a room alone, with almost no contact with other human beings, and only allowed out of this room for the absolute minimum amount of time per day. It's been shown to cause serious mental illness in otherwise-healthy people who are subjected to it, so doing it to someone who's already suffering from mental illness is the very definition of counter-productive. It is not something to be glorified, or even used lightly as a throwaway joke. The impact of this sort of theme and material on present-day people who currently need/receive mental health care cannot be overstated. The vast majority of people who have had suicidal thoughts are utterly terrified of hospitalization, whether they've experienced it or not. Everyone who has seen a loved one hospitalized for mental health issues has horrible (and sometimes traumatic) memories of watching the process and/or visiting. And for LGBTQ people in particular, hospitalization almost always causes far more harm than good, frequently resulting in suicide or suicide attempts immediately after release. People with borderline personality disorder or severe bipolar are frequently in and out of such facilities. People with schizophrenia, even if it's well-controlled, live in constant fear of long-term hospitalization or confinement for a single slip of their grasp on reality. So, centering a convention theme around the actual experience of mental health hospitalization, even if it's veiled in horror movie/game tropes like haunted buildings, is flagrantly insensitive at best, and could easily be a major PTSD trigger for a lot of potential attendees. Furry convention themes are usually not a particularly strong part of the attendee experience, and they often get more of a focus than they deserve. However, they strongly influence the convention's marketing and public image, and can also have an influence on the artwork attendees commission, the costumes they wear, and the panels/performances they put on. And, perhaps most importantly, they can be a barometer of the collective personalities and priorities of the con's staff. So, while a good theme isn't necessarily going to improve attendance, a bad theme can certainly drive people away, and I suspect that that's exactly what will happen to Furpocalypse if they don't change this disgusting theme. I've certainly scratched it off my list of conventions to potentially attend.